on September 20, 2018, 5:15 p.m. In April 2018, UAE petrol station operator, Abu Dhabi National Oil Company (ADNOC Distribution), announced the introduction of self-service refuelling pumps at their petrol stations with full-service fill-up available as a premium charged value-added service. After running trials across a number of outlets, the change was extended to a wider network of fuel stations at the end of June. In a market where customers have grown accustomed to having an attendant refuel their vehicles at the pump whilst remaining seated in their air conditioned vehicles, this change has been somewhat poorly received. YouGov BrandIndex, the daily brand perception tracker, shows declines in multiple metrics ever since the announcement. Overall brand health perception as measured by Index dropped from 18.1 in mid- June to a low of 12.4 at the end of July. However, the brand recovered slightly by the end of August to 14.2 points. Sentiment towards the brand also suffered a similar fate declining from 14.7 down to a low of 10.1 in early July but has since recovered to 13.4 nationally by the end of August. 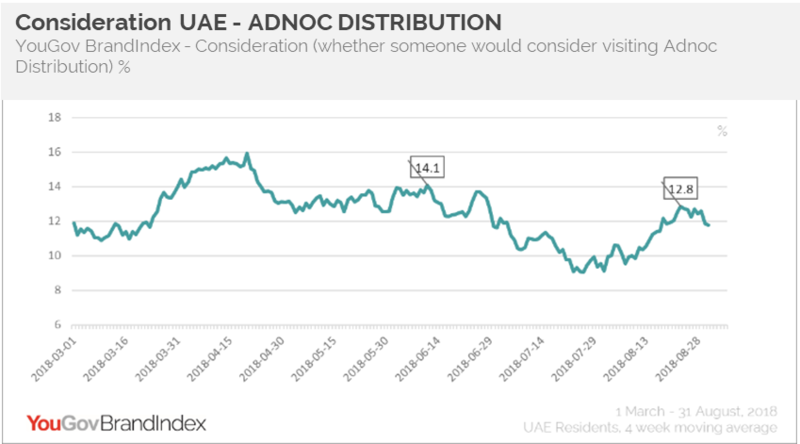 This has led Consideration of visiting an ADNOC Distribution petrol station decline nationally from 14.1% in early June down to a low of 12.8 % by end of August. The declines are even more pronounced amongst residents of Abu Dhabi where overall brand health has declined from 22.6 in mid- June down to a low of 10.6 a month later and recovering marginally to 12.4 by end of August. At the same time Sentiment declined from 21.2 down to a low of 7.9 but has also recovered to 15.4 points as of the end of August. This has also lead to Consideration of ADNOC Distribution amongst residents of Abu Dhabi dropping from 24.7% in June (before the service was introduced) down to 10.7% by the end of August.